On assignment pages, you can enter grades, leave feedback, make notes, upload/download files, edit assignment info, and view assignment stats. indicates that there are unread comments or files on that student's feed. indicates that you've already viewed any comments or files on that student's feed. Click the student's name to go to the assignment detail page. Click Enter Grades. The fields under Grade/Percent and Letter Grade will open up for editing. Enter the number of points the student earned under Grade/Percent. If a student earned 42 points on a 50-point test, enter 42—NOT 84! Populi will automatically generate the percent/letter grades for you. Alternatively, you can select a Letter Grade from the drop-down. Populi will automatically generate a Grade/Percent.. If you're using a rubric, have a look at this article. Leave the assignment grade blank for that student. If your students have uploaded files to the assignment detail, you can download those files individually or all at once. Individual files: Click the student's name to go to the assignment detail (see below), find the file, and click its name to download it. All files: On the main assignment page, click Download Assignment Files. This creates a .zip folder bearing the name of the assignment; within you'll find folders for each student and all files they've uploaded to the assignment. Assignment detail includes a feed where you can interact with the student about the assignment and enter grades for his work. Type or copy-paste your comments in the text area. Attach a file to your comment if you wish. Check to make this an internal note (visible to you but not the student) or leave un-checked to make it Public (visible to the student). Internal notes are available to you when entering course comments on the final grade page. Click to delete any comment or file from the feed. 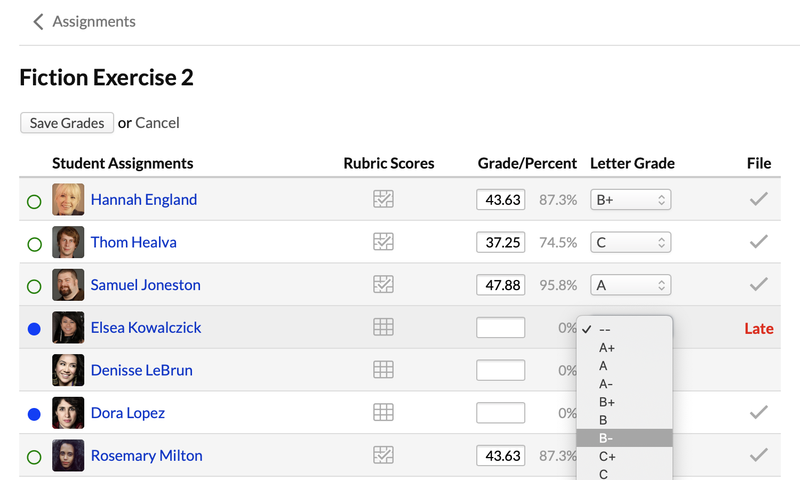 In the right column of the detail screen, you can also Enter Grades. This works just like entering grades on the main assignment page. Use the arrows or the drop-down to navigate to another student's assignment detail. Click the assignment name to return to the main assignment page. Enter a number grade or select a letter grade. Write a comment, upload a file, and check if you wish to keep the note internal (that is, hidden from the student). Click Save or Save and go to the next student. Discussion and peer review assignments have additional grading and review options. The Info panel contains the assignment's settings. Click edit to change any of these details. Read this article to learn how to give students exceptions for due dates and availability.